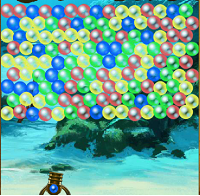 Bubble shooter game in a beautifull ocean setting. Match 3 or more bubbles of the same color to collapse them. Collect the required number of coins to pass the level! Have Fun!